Decorate your nails with colorful and trendy nail art designs. Check out 11 simple step-by-step designs and get started right away! 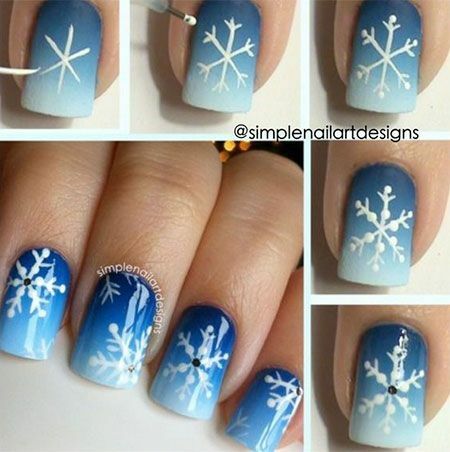 Who doesn’t love nail art? It is one thing that’s guaranteed to set you apart, no matter what the occasion is. No fuss about whether it fits or works for your “body type”, sometimes a gorgeous mani is just what a girl needs. Which is why we have brought you 11 gorgeous nail art designs so that you can wear them every single day. Start simple. 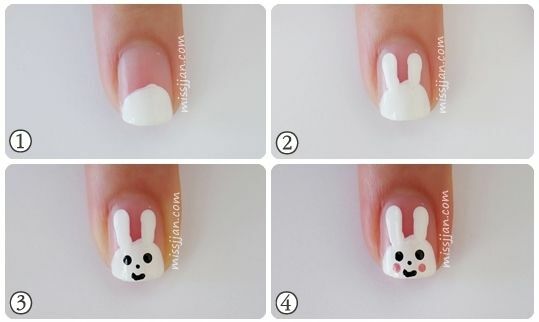 Look at basic nail art designs which require no more than a dotting tool or two. Choose some pop colors like a bright, gorgeous pink and create edgy patterns. End with a scatter of a few dots on your canvas and a clear top coat so that your design remains firmly in place. Once you master this, take your new dotting skills ahead. 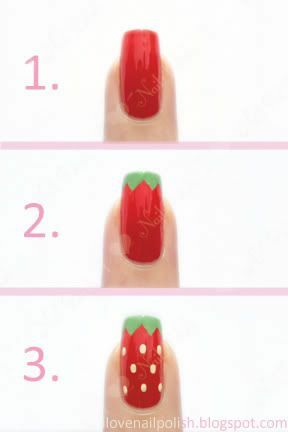 Create a strawberry pattern (image towards the end of the post) with a deep red base coat, and some edgy green tips. Add tiny white dots (well, they are somewhere between dots and lines) to get that authentic strawberry look. Why not do something fun, funky and basic at the same time? 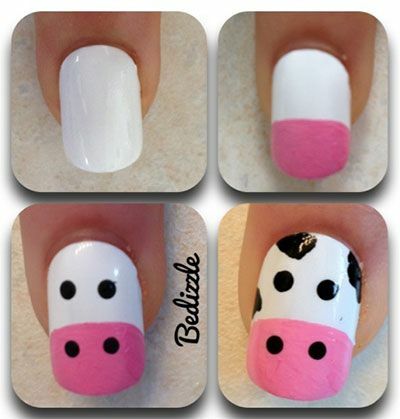 Create cute little cows using just 3 colors of paint and one dotting tool. Even adding patches on the side is not a problem, as they don’t have to be in a particular pattern, so you can just go wild with a slim brush. Remember to seal it in with a clear coat of nail polish. Stripes are the next step of mastering nail art. 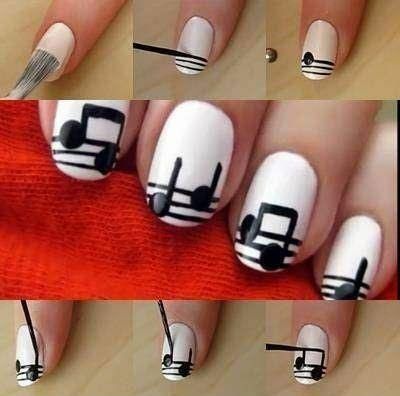 Pick the musical notes nail art to act as a bridge between dots and stripes. The stripes are simple enough to achieve and the dots as a guide for creating the musical notes. All you need is 2 colors of nail polish, 2 brushes of varying thickness and one dotting tool. 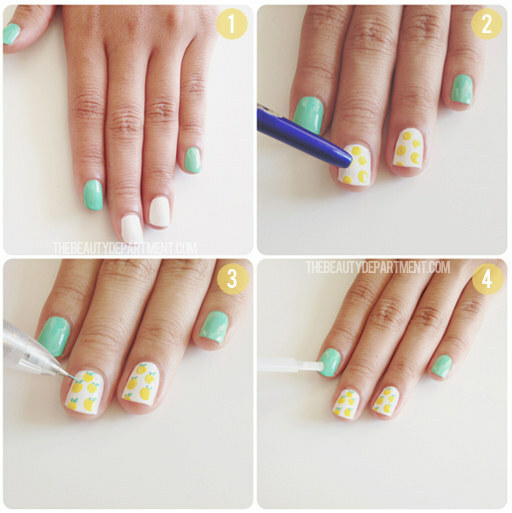 You could even opt for the cute pineapple nail art (image towards the end of the post) which combines your dotting and striping skills and tests them at a higher degree. My favorite is the black and tan nail art. With a basic tan coat and artfully placed strips, the almost chevron effect is mesmerizing in itself. 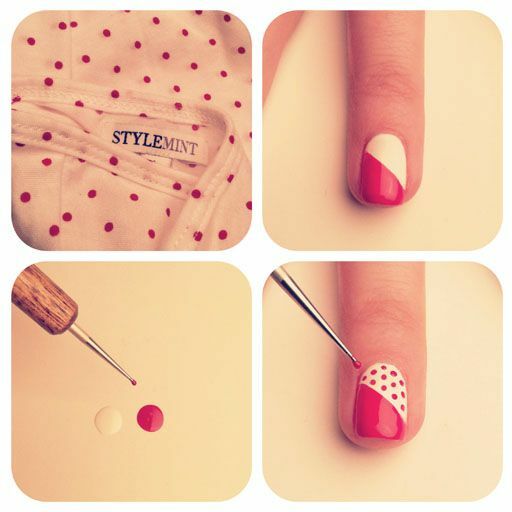 Add to it the series of mini dots and you have a picture perfect manicure. With aids like the stripes, achieving the nail art of your dreams is not so difficult. It works especially well for beginners though you can continue to rely on these tools even after you gain some proficiency. While we nail art buffs love to keep experimenting, it’s important to let your nails breathe as well. Give them a week or so without any nail polish at all, so that they remain pink and healthy. Excessive usage of nail polish can cause you nails to look dull and yellow, and who wants that? Remember to begin with a base coat and end with a top coat- this takes care of your nails and your style!